In a sentence or so: Seth drowns. He should be dead, but instead he wakes up in his childhood hometown and it's completely deserted, spooky, and just Not Right. Mystery ensues. Do yourself a favor and do NOT read the summary for this book that's printed on the back or on Goodreads or wherever. Not knowing is like the best part of this whole experience. Seth doesn't really know what's going down when he wakes up in an improbably place - so neither should you! 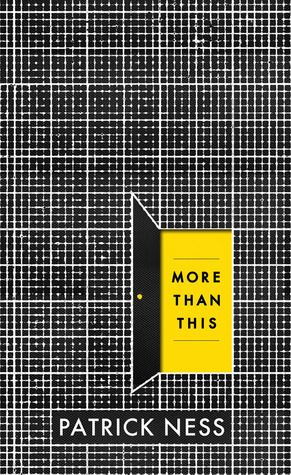 What you should know is that Patrick Ness takes a fresh spin on the whole Unreliable Narrator idea (which I already LOVE) with Seth by alternating between his past and his present. We don't know what the what is going on with his present, so we learn more about who Seth is by his flashbacks. Oh Patrick Ness. I love your writing and characters and plots so, so much. I would read your grocery lists if you published them. For real. You own at writing. Ness is insightful, but not preachy. Creative, but not exhausting. Raw, but not abrasive. The balance is perfection, you guys. You are looking for a heady read with well written characters and a big ol' dose of social commentary with a sci-fi twist, dashes of relationship development, the importance of self-worth and a whole lot of feels. I loved this book. You're right - going in clueless is the best way to do it. It took a challenging idea and just went for it. Fantastic. So glad you're with me on the clueless start! It made the mystery more mysterious, you know? You know I bought my Nesses after you and Asheley gushed about them and now I want to read this one toooooo!! I just have to get to reading the others first though. And I won't read the synopsis of this one! I promise! This is one of those books I was really excited about when it was announced, but once I downloaded a review copy it just kept slipping through the cracks. So annoying - I need to pick it up! The guy SLAYED me with A Monster Calls, so I'm definitely ready for some more feels. Oh Allison - nothing slays like A Monster Calls. NOTHING. But this one definitely packs a punch. EVERYBODY is talking about this book. Or has been for the past couple of months. I'm one of those people who, when everyone says you should go into a story blind, wants to know everything about the book beforehand. Alas, I still have no clue what it's about, but I can add your review to the never ending list of people who have enjoyed it. I suppose I should get to reading it sooner rather than later. There's so much to discuss! Some liked it, others didn't, but man it is definitely one for discussion! Yes to all the things! You know how I feel about this. Patrick Ness forever. I REALLY need to read something by Patrick Ness soon! I hear nothing but good things about his writing. I love the whole unreliable narrator idea too, and I'm glad to hear Ness manages to use it well. I'm looking forward to picking this up. :) I'm glad it worked for you, Lisa! SAM PLEASE READ HIM NOW. Ness will change your life. I really have to read a Patrick Ness book. I've been meaning to, but I somehow never get around to it, which makes me SAD. Please gently remind (a.k.a. book push) me that I should read his stuff in 2014! I haven't yet read a Patrick Ness book, but I am curious about this one. I think you're right to suggest skipping the summary. I read it and I'm not totally sure what it's about. And then people ask me about it in the bookstore I work in and I'm just like... ?? I hear it's awesome?? But really I clearly need to read it - based on your review and everyone else's!